I'm glad you tracked them down. Stealing and posting on websites with different backstories like they made it is just low. I sent him the thing about the guy that Borrowed Blanko 1.9. I think that to steal these things is really wrong and these people should learn that stealing causes nothing but trouble. hey, jang. I have just finished a MOC of the 2012 XT4- it took a really long time ( like an hour) 1 bacause the body of XT4 is NEW SMALLER BODY- perfact for recers mocs. so that IS the main problem, however i want to take photos of it so it can be seen and innovated. never the less there is but one person who could do so. 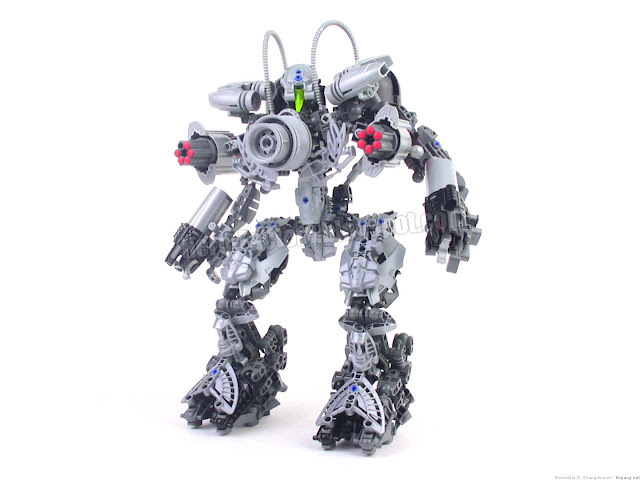 can you make a MOC of XT4 next??? jang, if you do, i suggest using the meltdown mask. No offense, but I doubt that JANG is the only person who could successfully create a mock-up XT4. YAY!!! I helped stop robbers!!! YAY!You have just became a LEGO hero factory rozzer! It's what james may calls the cops. hey jang u tell them not to take peoples work like yours. Big round of applause for everyone who reported stolen MOCs, especially Avron, who reported quite a lot of stolen material. Hey, LegoJang! On the Hero Factory Gallery, a user named dannyboy1234dan has stolen a pic of your Bionicle MOC Greed! He named it "Creation from Heropad application". Lets get LEGO's attention to report this a******! Nice job Jang, bringing some delinquents to justice. It must feel terrible to have your work essentially stolen from you. That drone is also EXTREMELY COOL!!!!!!!!!!!!!!!! Jang!A user called dannyboy1234dan uploaded your picture kalek 2.0 onto the official hero factory gallery! Shame on those who steal. I'd also like to say that the original maker of the first Drone MOC actually commented on JANG's version, saying how awesome it is. I don't know why people steal your MOC pictures for no reason.Shouldn't they make their own MOCs and post their own MOCs onto the official hero factory gallery?And anyway,I made my own MOCs but I never post any of my MOC pictures onto the gallery.People who likes to steal,think twice first. While technically, nothing is "wrong", why not actually have some fun and try to build things on your own and use your creativity? If you don't have the money for the parts but do have the money for a computer you are kidding yourself. Dude what exactly are saying, No offense or anything i just don't understand. Nice idea, but don't you think it would ruin the effect of the MOC if every picture had them holding a 'built by JANG' sign on it? Those pathetic thieves, i dont know why they think they can just steal your work like that. btw, I was the one who reported the stolen picture of surge. (LegoDude2465 from youtube). Hey JANG, ive recently uploaded my first Bionicle MOC. His name is Krodan, and hes a toa of Iron. I dont have many Bionicle parts at all unfortunatly... Could you watch the video and tell me what you think? My youtube name is LegoDude2465. What I said is that technically nothing is "wrong", but you could simply make your own mocs and get more fun out of it. Nothing i wrong? No offense but jang just said stealing is wrong. And it is. I do agree with you about them making their own mocs. In all honesty there is no right or wrong. Can you show me a scientific law that says that it is wrong? caleb1196 stole your "the drone"picture and upload it to the official hero factory and he named it"creation from heropad application"
hi,I'm wishbear2003 here(that's my lego username)and I got another robber who stole your MOC picture,specter 2.0.The person is johncosqrove1997.He zoom the picture right onto the weapon itself.He named it "creation from heropad application"Actually I'm the one who reported about dannyboy1234dan stealing your kalek 2.0 picture and caleb1196 stealing your "The drone" picture as well. Just as a note when you report a stolen MOC, you should do it on the latest post. But don't worry, I already reported them on "Lorne addresses the Sempax" (before I even saw this comment). I can't tell if it's linking or not, but I found yet another of these pests. yeah u showed those stupid bully trolls keep fihgting 4 justice how dare they take pictures of ur nikles stupid troll bullys should know better!!!!!!!!!!!!! I made a guy too, hes really cool. 100% not stolen from anyone else.